Indiana has battled with the Buckeyes the past two seasons. The Hoosiers will host Ohio State to start the 2017 season and will have extra motivation as Kevin Wilson is now on the Scarlet and Gray's sideline. Tom Allen is IU's new head coach and he has a lot of work to do in order to get his team ready for the Ohio State juggernaut. The biggest bare spot on his roster is replacing Devine Redding who left after his junior season to pursue a career in the NFL. Redding led the Hoosiers in rushing in 2016, but that wasn't enough to get selected in the 2017 NFL Draft. Below you will find facts and stats about the series and Indiana's returning players. Hopefully this will help bide the time until college football Saturdays return. Ohio State is 73–12–5 all-time against against Indiana and is 26–2–1 as the away team. This is the first time Ohio State has opened the season against Indiana. Only three times in Buckeye football history has the team started the season against a conference opponent on the road. It is also the first time Ohio State has started a season with a Thursday road game. Ohio State played Indiana, offensive coordinator Kevin Wilson was the Hoosiers' head coach. The Buckeyes played in Bloomington was 2015, No. 2 Ohio State won 34-27. Indiana defeated Ohio State was October 8, 1988 in Bloomington (41-7). A ranked Buckeye team lost to the Hoosiers was 1987. Indiana gave the Buckeyes a 31-10 beat-down in Ohio Stadium. The first game of the season was played on a Thursday was September 2, 2010. No. 2 Ohio State defeated Marshall 45-7 in Jim Tressel's last season as head coach. Ohio State started the season on the road was 2015. The No. 1 Buckeyes defeated Virginia Tech 42-24 in Lane Stadium. The Buckeyes lost a season opening road game was 1892. The team traveled to Westerville and lost to Otterbein 22-16. Ohio State opened the season with a Big Ten game was 1976. Woody Hayes' 4th ranked squad defeated Darryl Rogers' Michigan State squad 49-21 in Columbus. The Buckeyes opened the season with a Big Ten road conference game was 1975. No. 3 Ohio State defeated No. 11 Michigan State 21-0 in East Lansing. Bowl Game: Lost to Utah 26-24 in the Foster Farms Bowl. Coaching Status: Tom Allen (0–0) first season. RB Devine Redding led the team with 1,122 yards and 7 rushing touchdowns. Following his junior season, he declared for the 2017 NFL Draft on January 6, 2017. Redding was not selected by an NFL team. This is the second time the Buckeyes have played on August 31st. In 2013, No. 2 Ohio State defeated Buffalo 40-20 in Ohio Stadium in the program's only game played on this date. The Buckeyes are 1–0 when ranked in the Top 10 on August 31st. Ohio State has never played a ranked opponent on the 31st of August. This will be the program's first road game on this date. 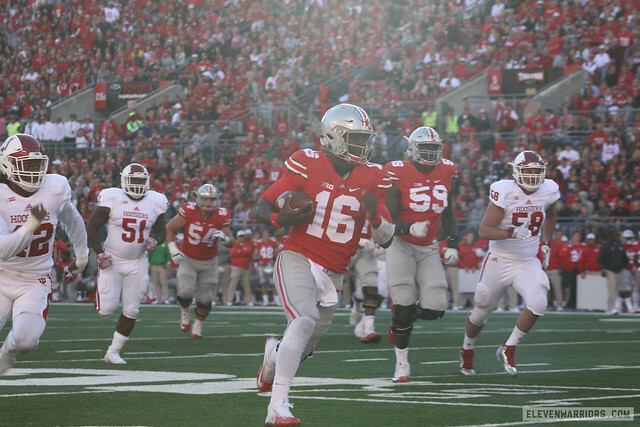 Ohio State is 111–12–4 in opening games and is 7–2 when starting the season on the road. Otterbein (1893) and Oberlin (1892) are the only road losses. The Buckeyes have won 17-straight season opening games. The last opening game loss was to Miami. The Hurricanes defeated No. 9 Ohio State 23-12 in 1999. Ohio State has never lost a season opening game to a Big Ten opponent (12–0). The first season opening game against a Big Ten foe was October 4, 1924. John Wilce and the Buckeyes edged James Phelan's Purdue Boilermakers 7-0 in Ohio Stadium. Note: If there is interest, a new preview for each game of the 2017 season will be posted every Wednesday. Next week will be Oklahoma.